Promoting natural building, and sustainable design and development, through research, training, education and consulting services. Our work involves finding safe, dignified shelter solutions for the 1.2 billion in need of affordable housing. I want to build a small (approx. 500 sq.ft.) eco friendly house on a small lot on a barrier island overlooking a lovely tidal creek near Jacksonville, FL. I think the house should be on pilings because of possible hurricane flooding. Can I use dirt (or sand) bags for a house on pilings? I love nature and want to live “lightly” on the land. Any suggestions would be greatly appreciated. Hello, I am very excited about the native spirit home design. I have couple of questions. What are the square ft of the rooms in the tower , could they really be used as a functional bedroom queen bed and such. I would be building all with earthbag this summer! I live in alaska and this design is very inspireing. What is the diameter of the main hogan and the tower? Can the tower or the main room be made larger. Thank you for you time!! So as you can see the floors in the tower are small. You couldn’t fit a queen sized bed (except maybe on the first floor). It’s intended for a small home office, storage, sleeping loft, that sort of thing. You could make the tower larger, of course. Hi: the combination of an earthen building with a green roof is very attractive. Is the green roof built the same was as tradition G.R. designs where there is a waterproof layer, drainage layer, and growth layer? The area that I am planning on is in Baja California which has a dry climate, but when it rains, it pours. So water erosion is a chief concern. Cheers..
Green roofs are not appropriate for all climates, including the Baja and other desert environments. It would require a huge amount of water, much like watering a golf course in the desert (= crazy). For your area, I recommend a light colored metal roof for roofwater collection. Hi, I’m going to be finishing college, starting a career, etc… and I really like the idea of building a sandbag house. Having smooth round corners in the house (cool looking), great insulation, comparatively inexpensive, etc… sounds pretty awesome. I’ve been doing a lot of research on sandbag houses/construction and when I find the right property I’d like to build one. I’m not looking to go totally minimal or green on this. I want radiant floor heating, electrical outlets, full plumbing, etc… One thing I have been unable to find is how people are running electrical/plumbing through their house? I don’t want a bunch of extension cords lying around. Could you just install large diameter conduit and run wire/outlets before you cement/plaster over the sandbags? Could you build an elevated floor and run electrical/plumbing around the perimeter and have access panels and outlets in the floor? I read few articles on Your site but I didn’t notice any information about durability or “expire date” 🙂 of earthbag houses. I’m not concerned about safety or quality of earthbag or samdbag houses, but is there a point in earthbag house life time when it needs complete rebuilding (because of its age)? And what about not solid grounds, like sand grounds or rainy areas with lots of rains. How firm earthbag houses are on such grounds? I think earth/sandbag houses equipped with solar systems can give a real comfort needed in modern times. I like that idea. Sandbag structures have been built for about 100 years by the military. That says a lot. And sandbags are used for flood control due to their strength, low cost, simplicity and resistance to moisture damage. So even though this is a fairly new method for building houses, there is quite a bit of history behind it. Plus, most houses in the world are built of earth (about 1/3). And earthbag buildings are stronger than most buildings made of earth, largely due to the tamping and barbed wire. What is the life expectancy of earthbag buildings? A properly built earthbag structure should last hundreds of years if maintained. I don’t keep a close eye on prices, sorry. Prices probably vary all over the world anyway. So the usual advice applies — shop around for the best product at the best price. There are lots of efficient stoves out there. I would use Google to track down the necessary info. Every important feature that you could use on a conventional house can be used on earthbag houses. They don’t have to be primitive! Almost everything you need to know about earthbag building is offered on our websites for free. Click on the links on the right. And if you buy a plan, I’ll guide you through the important steps. I intend to build a earthbag house of approx 800-900 sq.ft on land which is overlooking a beautiful lake. But there are lot of wild bush/trees which obstructs the view. Can I build this earthbag house on an elevated platform / terrace? An elevated house will give a superb view and also the remaining space can be used as terrace or elevated patio. Yes, you can use what I call ‘lightweight earthbag building’ — bags filled with scoria (lava rock), perlite or vermiculite. Build the platform using wood poles or other method, and then build the lightweight earthbag walls on top of this. This requires moving the materials up on the platform, but the benefits of a superior view will far outweigh the extra work. Thank you for the quick response. I would like to take a workshop on earthbag building. Anyhting in near future? I intend to build an earthbag house in Hungary but I don’t know how it resist to wetness. We have much rain and snow from autumn to spring. How can I isolate the wall of the dome(s) from water? Earthbags (sand bags) were designed for flood control. After 50 years or more, sand bags are still the number one choice for holding back flood waters. However, domes evolved from desert regions where wood was scarce. In rainy climates, I recommend building a roof like the Kentucky Dome Home: http://www.earthbagbuilding.com/projects/kentucky.htm. Wider overhangs would be even better. This will greatly reduce your risk of moisture problems. This also allows for roofwater catchment. Another option is to build more conventional shaped structures with roofs instead of domes. We are a couple that moved to North Alabama from Florida. We are currently looking for either the right house to move into, or we might consider purchasing a larger property with something livable on while building. I like the idea of using earth bags, but what about building permits here in N Alabama or in Tennessee if no suitable property can be found. Codes vary from city to city, region to region, so you’ll have to investigate what your code officials want. There is a loophole in the code for alternative materials such as earthbag, strawbale, cob, etc. This approach typically requires a stamp from a licensed engineer or architect, which should guarantee code acceptance. The best approach is to network with local natural builders and design professionals before approaching code officials with dozens of questions. Talk to others who work in sustainable building and/or homeowners who have already gone a similar route and learn as much as you can. Find out if your codes are online and study what is required in advance. Earthbags are ideal for building underground, although I would limit the total size to keep it manageable (especially for a first time project). Round structures are inherently stronger than square structures and will withstand being covered with earth if properly constructed. Also, your idea about creating an English cottage style house is a good one. Be sure to research thatch roofs. They can be very time consuming depending on the climate and technique used. Thank you for your swift response. I will begin constructing a beautiful “Shire” like root cellar 2-3’rds underground since it will be extremely important for us to have a dark cool and dry place for our various vegetables. I believe thatched roofing can nowadays be constructed the easy way by ordering “thatched” roofing tiles or shingles. On our family owned Ranch back in Sweden, where I grew up, we did have a small guest house with a traditional thatched roof. I did have the opportunity to watch as we had it “re thatched” however it is a look I would rather choose to obtain by using thatched shingles or tiles. I agree about using thatch panels, although they’re quite expensive in many areas. They’re available where I live for dirt cheap. They’re about one meter long by 1/2 meter wide. Using panels makes thatch roofing much faster. Great Root cellar. I would like to build ours longer and wider though. Been thinking along the same path regarding the steel reinforced cement roof but rather than pouring it in place I have made plans to cast it in sections, then adding them in steps with the help of a sub compact tractor / loader. Building the vault in sections sounds like a great idea for larger rootcellars. This allows you to reuse the same mold and make components one at a time. Been busy the last couple of days since we found and signed an offer on a 3.40 acre property in a somewhat remote but very nice area. The property is square shaped and seem enormous even to me (we had 20-30 acres surrounding our ranch where I grew up). Anyway Step one involves building a sandbag wall around the entire property. Not because we want to keep creatures out, but because we have several animals and plan to have more. Chickens for instance. Chickens have to be fed and besides sharing our various future crops with these happy critters, they eat various insects etc (we’ll even include a couple of Guinea hens who I’ve read like to feast on ticks). Anyway I love to think things through before I do anything and so far I came up with creating a large pond. I saw a nice “banana shaped” pond in my head to day when I thought it through, walking around the property. There will be two islands with trees I wish to keep in this pond, but I’ll start small and use the earth to fill the thousands of sandbags required to build a wall and the root cellar. Things that’s still bothering me regarding the wall is what to use to cover the sandbags economically. I’ve read that cement isn’t good to mix with this type of construction (doesn’t breathe), besides it’s very expensive for this massive amount of square footage. Lime plaster is probably your best option for the wall, although this also requires a great deal of time, labor and materials. So practice on something small, and then see what you think. You’ll probably opt for a faster, easier method for extremely large projects like this unless you have a source of very cheap labor. Regarding the pond. I would like to make this pond project able to sustain itself. The number one problem right now involves the water table on the property. There is a drilled well and a pump (looks new). I might have to blanket the entire bottom with some plastic or rubber like material in the worst scenario. The pond will eventually contain it’s own biological system with perhaps carp fishes (have to read up on that) I’ll build a nice looking bridge or two to connect those islands and install a fountain. I should also have some solar / car battery powered light sources that attracts insects (food for the carps) turning on after dark. The fish is necessary when you build a pond to ensure that your property doesn’t become a breeding ground for mosquito’s.. Creating a pond and raising fish using the hole you’ve dug for your soil is a good plan. You can do anything with enough time, patience and determination. Yes, I always felt that I deserved to be famous for something, but the longest Sandbag wall ever built? Wow. Well I still have to be able to plaster this enormous project. When starting the wall project, I probably should start building the corners, and plaster the wall as I go, every 30-50 feet to prevent UV damage. then continue completing between the Northern corners to provide some acoustic relief for our closest neighbor. We will be depending on a Sub compact tractor with a Loader, Backhoe, Mower deck, wagon and eventually a tiller to complete our property plans. Kubota have several various series of Tractors that seem reasonably priced. For our purposes I think the BX series will be sufficient. You need to divided the wall into sections, say 16′. Each section needs to end with a buttress, column or other stabilizing element (ex: a jog). Then start at each end and work toward the center. Then plaster it with the first coat to protect it from UV damage. It’s hard to tell the size of the tractor you’re referring to. Too small and it will be underpowered. Here’s a picture of a Kubota tractor: http://www.pagelandfarmequipment.com/kubota.htm. The tractor with the hay bale seems like the minimum size to me. Yes 16 ‘ sounds like a good 1 full days work (plastered and which farmer works only 40 hour weeks?!). I have plans to include buttress’s perhaps I could alternate them so that every other one is on the inside? (for esthetics) The BX Kubota series (currently their most compact) are sub compact tractors however, even the weakest loader (LA 203) within this class can lift 408-613 Pounds, and Loader (LA243) 518-745 Pounds So, just as Napoleon did (I’m sure), as he proudly rode home, bragging and humming his silly little song about how “size (really) doesn’t matter”, can the BX series Diesel powered tractors (If you could imagine a Diesel sing).. So the only task it perhaps wouldn’t be able to perform is lifting those pre-cast cement roof sections. But could those little tractors excavate earth all day long and load it on a small dump truck? By small dump truck, I mean a pick-up sized rig with dump bed. Or maybe you could load it on a small wagon and pull it. Yes, It can lift pretty high so both should be possible. Anything bigger however and you would probably be better off loading by mounting a ramp prior to unloading (vivre la liberte ;o), and the BX series all have 4WD. I’ve seen an L series Tractor locally with the loader and backhoe, slightly used for the same price the brand new BX series tractor was (around 17 K). OK, the loader part sounds adequate. I would want to test drive how well it excavates to be sure it can do the job. The backhoe was also demonstrated today, so I’m still confident that it will perform ok.. Yes I remember. Can you scan and send it by email? My email address is strawhouses [@] yahoo.com. Thanks. The other day I read Kubota tractors are rated the best. I can’t verify this, it’s just something I read on the Internet. Anyway, I’m sure they’re pretty good. Also, since you’re going to build a very long wall it will be wise to think through the design very carefully. Yes and I believe that I need to dig down to below frost depth and at least put a layer of gravel as ground preparation.. the design is an ongoing process and perhaps I might start with a lower wall first that could be continued further down the road.. Yes, a rubble trench (gravel/rock) foundation is typically the lowest cost approach. This needs a French drain where there is sufficient moisture that can freeze and expand (frost heave). Use gravel-filled bags on first 1-2 courses to prevent wicking. Provide an occasional drain between bags so water can’t build up against the wall in low spots. Lots of details, so I recommend getting a book on wall building. I finished editing the Kubota demonstration from the other day. I trust you don’t mind that I dedicated it to you, and the discussions here? Anyway, it is ready to be uploaded amongst my other videos on YouTube. I’ll post a link to it when it’s uploaded..
Sure, send the link when it’s ready. It looks to me like the backhoe portion will struggle to do everything, depending on how hard your soil is. One option is to hire a bulldozer to excavate the pond to save time and wear and tear on your tractor. A dozer could do a pond in about one day of work, so the cost should be reasonable. Yes, I agree that using the BX Backhoe is far slower than it would be compared to using a full size one but since I won’t have a crew at my disposal it will still be way faster than “even” I could keep up with it’s performance (16 feet a day). It’s probably better when the earth gets used “right away” stacked and compacted in their sandbags, and the wall plastered with, shall we say 16 ft increments. Then of course there’s the problem after I reach the water table, I mean using this technique that I originally intended since I’m doing this project single handed (apart from the Kubota) requires that I use at least one motorized pump. I looked at one today (5 Hp / 250 Gallons/min) but I wonder if one would be enough to keep excavating the pond. the great news is that they are only $250 per pump. Great prize..
I’ve seen underground gravel storage systems with pipes running through them. Small fans circulate the air through the pipes and house to even out temperature swings between night and day. But these were fairly large systems, and I’m not sure how effective a small one would be. That’s a lot bigger than I was expecting, so yes, this would help keep a small home cozy. I would place the solar panel(s) along our Northwestern wall corner, where our food lots will be placed, just to get rid of them plus any kind / amount of “heat radiation” should benefit our plants along their merry way to our root cellar. I will also take measurements, during the hot summer days inside the root cellar, and compare those with measurements taken near the bottom of our deep pond, to see if this concept could be used for improved cooling effect inside or circular shelved , compact revolving root cellar compartment. I heard of marine cooling systems, based on this Principe. A long hose was fed below until it approached the bottom where cold water was pumped up through a fan powered radiator inside the hull, then dumped overboard.. This should work. I would start with the basic rootcellar, measure year-round temperatures and then decide if additional cooling was needed. There are many things like this that can be done for not too much money, yet look how much energy (and money) people waste. I am about to build an earthbag home in Patagonia, Chile and can only find two or three point barbed wire. Do you reckon this could do? Thanks for your time and the information here. I think you could get by with three point barbed wire. Maybe limit the over all size to play it safe. For example, don’t try to build a large dome. But I see no reason you couldn’t start something like this also. I see competition as a good thing and encourage you to give it a go. Example: I found a website yesterday that has already attracted 10,000 “hits.” A guy in Florida is building an earthbag survival/hurricane shelter, and comments from readers stretched for 18 pages! That’s just one project, so obviously the potential is there. Im interested in hands on work with earthbag building. I see that Carl Mikael Borsing is located in North Alabama, and I in central alabama. I am wondering if you know if hes accepting any volunteer work to help with the building. I am looking to build one of my own in the next year or so and the hands on experience is greatly needed! I am very itersting by your workshop , please send me a message for to know when you will intend to organize a new workshop in Thaniland . At this point, it looks like we’ll only have one or two workshops a year. It’s easier to arrange an internship. Scroll down on the Workshop page for details on our internship program. Fascinated by earthbag, and wanting to build the first earthbag-approved studio and then house in Australia. Will it be possible in Australia and specifically in Tropical North Queensland, where we have W41 to W50 wind rating? Our property is in the mountains, over an hour away from the coast, but still can be affected somewhat by tropical cyclones. We also have a stong monsoon/wet season between December and March. Hi Talila. Earthbag is suitable for hurricane and seismic regions. I got involved in this as I was looking for solutions to the 2004 Asian tsunami, where hurricanes, earthquakes, heavy rains and floods are common. After a lot of research I realized earthbag building is the strongest, lowest cost and most sustainable option. Built correctly, earthbags are like large, flat bricks that overlap each other much like masonry. Proper soil mixtures will tamp and harden almost as hard as concrete. Plus, you can add extra reinforcing such as plaster mesh up and over your top plate to help hold down the roof. Round or curved shapes are recommended to minimize wind resistance. The downside can be getting code approval. Earthbag is relatively new and hasn’t been thoroughly tested. We know it works, but more testing is needed to meet codes in many areas. It’s great to know the system will work here. Do we have to wait for the government to test the product and approve it, or can we get some plans off you, take it to a local engineer, and aim to submit it to a local council or private building inspector? We would start with a non-habitable class of building (office). We perceive that one of the many huge pluses of earthbag is its loadbearing strength with minimum framing. Have we a chance of getting loadbearing earthbag in an office structure approved here yet? How can we know? Should we aim for a post and beam structure and use the earthbags as ‘cladding’ – would that meet with readier approval and do you have plans like that? Input much appreciated. Building codes vary from country to country, state to state, region to region, even city to city, so there’s no way to know the code situation everywhere. Your best bet is to collect information from our websites and Doni and Kaki’s Earthbag Building book and meet with your building officials. You never know what they’ll say. Adobe meets code in many areas, why not earthbag building? Thank you for your prompt answer , regarding the intership program , do you think , 2 weeks it’s enough for learn the Earth Bag Builiding , i love the OM Dome , i would like to build this in New Caledonia , do you have in store the Building plans , i will request the building permit with our local government before to plan my venue in Thailand , sorry i am not perfect in English , but i am very enthusiast to start this project . Hi Charles. Yes, you can learn the basics in two weeks. You’ll have to buy the plans through Trevor Lytle, the builder/designer of the Om Dome. I suggest starting with a small dome first so you can practice your technique. Hi Owen! I am building a lodge on our mountain property in New Mexico with a full basement/root cellar. I have decided to go with a round structure. I am wondering if there are any structural limitations as to diameter. I am looking at up to a 56′ outside diameter. Also any advice on this one would be appreciated as I am just starting to dig my hole. I am also heading to Haiti later this year and want to explore using larger diameter earthbag structures for community buildings before I go. My plan is to use stabilized earth below ground and scoria above. I have a pretty massive center post to support the floor. Do I need to do post and beam on the perimeter? I have used earthbags for my barn there (30×36) which was recessed into a hillside (5′ retaining on 3 sides). This was a post and beam infill with buttresses at every 12′. I’d say it’s okay if you use good building techniques: larger bags (22″ wide), good fill material, two strands of 4-point barbed wire, 6 mil poly moisture barrier on the outside of the foundation, French drain, etc. Do your research, especially on choosing the correct fill material. And it would be prudent to hire a local engineer to do soil tests and run the calcs. I am wanting to buy some land and be 100% self sustainable; of course everything but property tax. So I want to build a berm with no plumbing, wood burning stove, outside kitchen for summer time. I still want to shower inside, metal bucket with holes up on a pully system with stones on the floor and 3 surrounding walls, a stone fireplace. I will be doing all of it myself with the help of my friends. any ideas? It’s extremely efficient: berm on the north, south facing windows, 12′ span creates average sized rooms, arc shape is strong, living roof, low cost/simple construction using locally available materials. You could use stone on all of it, although earthbags are faster. My plans show 18″ wide walls, which means you can use earthbags, straw bales, adobe, cordwood, cob, stone, etc. Maybe do stone on the bottom and earthbags on top of that. Bucket shower: add a shower nozzle (shower head) so you can control the water flow. I can’t thank you enough…you are a gift from Great Spirit!! But, I’m sure that I am not the first to make the observation. I’m interested in experimenting with EBBs in an ULE [Underground Living Environment] context. I know that you partially buried your workshop in the Minibuilding that you posted on Earth News. Could I apply the Minibuilding techniques to the Sunflower design minus the windows? Where, in your opinion, should I begin? 1. Larger domes require a fairly high level of accuracy. You might want to build a small one first with the same shape. I wanted to experiment with integrating a geodesic dome shell structure as both a construction guide and a support between the outer layer [pumice or reject sand] and the inner insulating layer [rice hull tubes]. I was afraid that that might throw off the arc required in order to complete the earthbag dome. 2. What about doors? How will you access the dome? Well, I’d like to experiment with a design much like the Eskimo people, with an arched, tubular entry that is also buried up to the point of entrance with a ‘natural door’ leading to the outside [something like an vertical earthen garden that can flap open and closed — think TeePee]. 3. You’ll need to provide adequate ventilation if you eliminate the windows. Excellent point, I’d also like to experiment with natural convection – and here, pls understand that I am not a scientist or engineer, so I may be speaking in laymen terms that are not fully descriptive. However, I was researching how the Egyptians used principles of convection in order to ventilate the pyramids. Intake air ducts placed at the bottom of the living space, while outflow air ducts were placed at the height of the living space. Of course, I am trying to work out how to screen the pipes at the surface point in order to ensure rodent/obstruction-free flow. 4. Consider using 24″ (100 pound) bags due to the extra pressure, at least for the lower half. Also, long tubes are probably stronger than using bags. Thank you for the specification. I was going to ask, but was afraid that I would be abusing of your time. You are most gracious in sharing your knowledge freely! I was wondering if you ever participate in ‘builds,’ even on a consultative basis, and what that might entail. Thank you. Glad to help. If you use bags of scoria or pumice, you don’t need rice hulls. I wouldn’t bury rice hulls because they would eventually rot and settle. Natural convection is great. Just make sure you have enough vent holes and large enough exhaust vent. A ceiling fan will really help. Maybe use two layers of screen on the vents: window screen to keep out insects and cover that with strong square mesh to keep out rodents. Fasten mesh to vent pipes with hose clamps, etc. Sorry, I’m too busy to participate in builds at this time. I can accomplish a lot more working from home, but thanks for the invite. You can post a message on our Bulletin Board: http://www.earthbagbuilding.com/bulletin.htm Just send me your message. I’m an architect from Pakistan. You must be knowing about the floods in Pakistan which have left millions of people homeless. Our firm is planning to provide habitat to the homeless and we want to give them permanent houses to live in. I came across this earthbag construction thing and it really appealed me for the reason that it’s exactly what we want at the time; low cost, sustainable and easy and quick to build. I’d really appreciate if you kindly answer some of my questions regarding this construction method. 1.If we intend to make double storey structure, what would the stairs be made of and how would they be constructed? i couldn’t find constuction details of stairs anywhere on the internet. 2.What would be the detail of the first floor’s floor and ground floor’s ceiling? 3. What is the maximum span for earthbag house? 4. What would be the detail of the area where vertical support ( be it timber or steel) meets the ceiling? 5. Who could provide us with rolls of fabric tubing, which is to be filled with sand? 6. Is there any need of formal training for this construction method? i’d be really thankful if you kindly respond to my queries asap. Hi Mishel, I’ll be glad to help. Most answers are already on our sites, either here, Earthbag Building Blog http://earthbagbuilding.wordpress.com/ or at EarthbagBuilding.com. Just stack earthbags in the shape of stairs. Very easy. 2. You can build any type of floor you want. Use whatever is most practical in your situation. 3. You’ll want lateral support about every 12′, depending on the design. Build small and simple so you don’t need complex designs. 4. No vertical supports are necessary in most cases. Earthbags will carry the loads. 5. Many suppliers carry tubes and bags, because bags are made from the long tubes. 6. It’s good to have one person who’s knowledgeable that can train others. No formal training is needed if that person already understands basics about construction. Build a storage shed or emergency shelter first to gain some experience. Then you can train others simply by showing (demonstrating) one step at a time. You can even do it without speaking in other languages. I will guide you through things for free. Write me at strawhouses [at] yahoo.com after you’ve read through our websites. Thanks a lot for your quick and helpful reply. Have been through the sites that you’ve listed. I shall be mailing you soon for some further assistance. Thanking you again. Have you seen our http://www.EarthbagStructures.com website? We try to put everything about disaster relief on that site. I ask you for advice a while back and want to thank you. I was the one with cancer and a roof that needed infill. Anyway, I decided to not use the burlap bags and I listened to all your suggestions. Thank you so much for helping out. in earthbag building. Instead of straw or paper. I also wonder if clean cat liter could be use where clay is missing. You don’t need any of those. Because the earth is contained in a bag and tamped, you don’t need fibers to hold it together. The binder is typically clay. Most people use subsoil with about 20%-30% clay. I would suggest a FB page. Yeah, but we can barely keep up already. Hi I’m from Russia, I like you idea, and i want to build a small country house using your tehnologi. But My land situated in a swampy area. The soil is peat. The groundwater is only 80 santimeters below ground level (in summer time ). Doe’s it posible to use this technology in sach condition? No, you need solid ground to build on. Hello, I have searched your site for wheelchair accessible designs and nothing is stated specifically. I am certain I can modify the designs to be wheelchair friendly, however, this requires a larger space for most of them. What is your take on universal design? My focus is on affordability, energy efficiency, durability, ease of construction for DIYers, sustainability, non-toxic materials, low embodied energy materials and simple designs that are suitable for the masses around the world. What I’m doing is an attempt to do the most good with my time. It’s difficult to meet every design criteria, all markets, all styles, etc. I offer very affordable custom plans if changes are needed. I am not currently in the means of paying for the construction or purchase of a house yet. But I am extremely interested in your designs. Especially your Triple Dome survival shelter. I just have a question concerning the outer layering of the houses. I live in Quebec, Canada and our winters can get pretty intense. Stucco or adobe simply wouldn’t last. I was just curious if your plans ever factor in winter climates. And how would concrete last as a covering of the earthbags? And are they adaptable to insulation for harsh winters? The stucco is under EPDM and a thick layer of earth, so it would be durable even in cold climates. Domes can constructed with insulating materials such as lava rock (scoria). Use the search engine on the upper right of the page and search for “insulated earthbag” and “cold climate”. Also, how do we find someone in our area who can teach us hands on how to build it ourselves? We would like someone to mentor us in person, and once we know what we are doing, we were going to recruit friends and family to help us, old fashioned barn-raising style. Also, does a yurt or a loft really improve the structural integrity of the home? And if so, significantly? Thank you so much! Your website is wonderful!!! Each of those designs could be built for a few thousand dollars if there are no codes or other related fees. The final cost depends on so many variables such as buying new versus recycled, high quality windows versus standard quality, site issues (excavating gets expensive), cost of materials in your area, and on and on. So it’s impossible to give a cost estimate. They will all be about the same cost, so pick your favorite and do a detailed cost estimate. Get a book from the library on cost estimating if necessary, but it’s really just a matter of adding up each material and multiplying it times the cost in your area. My upcoming book (due out VERY soon), my new video (due out maybe in one month) will be very helpful. There’s lots of free information on Instructables.com, my Naturalhouse YouTube channel and our various earthbag websites. Just google my name plus earthbag and you’ll find 99% of what you need for free. Here’s one of the best articles: http://www.instructables.com/id/Step-by-Step-Earthbag-Building/ Practice these steps as you watch the YouTube videos a few times and soon you’ll have the hang of it. Yes, lofts add strength, but a bond beam is plenty sufficient. Great website, which I’ve tried to thoroughly search/read, but want to confirm that the earthbag approach would be a good method of building an underground storm (and root) cellar. I’m thinking of building into a north-facing slope, about 10-12′ diameter. We’re in tornado country, but also want a cool place to store our food. Blessings to you, and thanks for making the tremendous investment into sustainable (and cheap!) construction. Oh sure. We have detailed articles on building rootcellars, roundhouses. Search our Earthbag Building Blog and EarthbagBuilding.com. I have been thinking about this as a means of providing a low cost home for my daughters and I. I have been going through a divorce and have had just about everything taken from me which doesn’t leave a lot so this seems like it might be a way for us to have a home. I have some land in mind but I really need three bedrooms because I have three girls with a possibility to add on later and include possibly a 4th bedroom. I would really like to have a house with a roof that looked thatched, specifically something that approximates the homes of Scotland. We live in Wisconsin so the winters here can be very harsh. Is such a thing within the realm of possibility using earth bags? I don’t have much skill in building but am willing to learn. Money is also precious right now but if it would be possible and there were some way to get plans for such a home, I would do what I could to get them. Can you help me get on the right track here? Thanks very much for your assistance. Earthbag is more labor intensive than strawbale. The same plans can be built with either bales or earthbags, but bales are faster and easier, and provide excellent insulation. Unless you have an inexpensive source of insulation, I would use bales. Put the bales on gravel bags if you don’t have codes. Thatch is extremely slow in most instances. It can take weeks or months of work. Note: the thatch on our roundhouse took only one day because we purchased pre-made panels. You would need the thick traditional type of thatch that’s very labor intensive. I recommend trusses or some type of roof where you can install R-45 insulation or even higher. Metal roofing is by far the fastest and easiest roofing material, and can be used to collect rainwater. Plan carefully because a three bedroom house is quite large, and so it will be fairly expensive so matter what. Most people underestimate building costs and how long it will take. Building codes can multiply the cost many times over. I was wondering if you had a plan for a 7 – 9 bedroom home? Also could earthbag be used to make a fence around my 10 acre? Send me a sketch in jpg format and I’ll take a look. Earthbag privacy walls are covered in my new earthbag book: http://www.earthbagbuilding.com/articles/ebbuildingguide.htm But earthbag is quite labor intensive and so the extra effort is best spent on housing or something else of high value. Maybe you have lots of low cost labor that would chance this. I am interested in both straw bale and earth bag building. My priority is an eco-friendly home that is airy and natural, but while cost is important, we are building a home not an emergency shelter and want something that helps people to see that you don’t need to be a “hippie” to have an eco house, they can be elegant and beautiful too. Most of the Earthbag houses I can find photos of have very rough finishes, can they be finished to give smooth, rounded curves the same way straw bale can? . I particularly like the floor plans of your triple dome survival shelter, and also the magic dome 2, but again, I am not building an emergency shelter, I am building a home which needs to be one I want to come home to every night – natural, eco friendly, off-beat is fine but not so far from mainstream that it cannot be re-sold if we do decide to relocate. Does that make sense? The main decision is your climate. Bales are way faster and easier, and are best suited to dry climates, especially dry cold climates. Earthbags excel where thermal mass makes the most sense — the American southwest, etc. Thanks so much for the quick reply, that finish is much more like what I am hoping for 🙂 I imagine you will put up a post when your video is ready? We have a good friend who is a very skilled builder of regular homes, I imagine we will use him to assist us so he would be able to use your book/video and not need much further knowledge? It is good to know that straw bales suit dry climates better, we have warm dry winters (cool nights) but hot, humid summers with regular heavy storms, so I presume bags would then be better? I’m going to publish this tomorrow on our blog since I’m sure others are wondering the same thing. The video will be announced and covered in detail on our blog when it’s available. Like my book, I think people will agree it’s the best video available. Many builders don’t like working with alternative materials. They get impatient. They’re accustomed to slapping and shooting 2x4s together. It’s a whole different mindset. Natural building is better suited to a loving, caring process by DiYers. That’s how humans have built their houses for countless thousands of years. It’s more like making an art project versus working on a factory assembly line. Earthbags are best for your climate, but the plans you’ve chosen aren’t the most appropriate. You want a plan with lots of ventilation. Also note, the Triple Dome Survival Shelter is very difficult to build and not recommended as a first time project. In fact, domes in general are not recommended in humid, rainy climates due to 1. the difficulty of getting sufficient ventilation (too many openings weaken the structure);, 2. difficulty in protecting the dome from water damage. You’re far better off choosing a design with a roof. Roofed roundhouses are ideal. They’re the easiest, fastest shape to build. You can also build roofed domes. Great, thanks a lot! You could build the spiral magic design as roundhouses instead of domes, am I correct? And then have more windows? Alternatively, I also quite like the roundhouse cluster, though maybe a bit big for just two people 🙂 though we do have 3 dogs, 9 cats, 3 parrots and a mongoose to consider…..
About half my clients change the basic plans shown on my site. For instance, the dome on the Spiral Magic could be turned into a roundhouse and the living roof could be omitted from the spiral. Then you could add lots more windows. It’s not difficult to change things around a bit. I have lots of roundhouse plans. Put some of the smaller ones together if it makes sense for your needs. they look the same as earthbags but a friend af mine says it is not a good i dea to build with they wil break over time from the sun ! You have to protect the bags from sunlight and use bags that are sufficiently strong. Make a test earthbag by tamping very hard to see if the bag will burst. Find a little subsoil with clay to mix with the sand and the walls will be stronger. Search our blog for details. Almost everything you can imagine is covered in hundreds of pages of free information. sorry if I’m far too ignorant in this regard, I would like to ask how you can say this house is stronger from disaster? while the material is only composed of a plastic sack and sand ended with a cement plaster? That’s a fair question. You see, it’s not “just dirt in a sack”. Earthbag walls are very similar to rammed earth. Search our Earthbag Building Blog http://earthbagbuilding.wordpress.com/ and you’ll find articles that explain how rammed earth buildings can last thousands of years. We have articles about the bullet resistance and black powder canon resistance, how to reinforce for earthquakes, etc. On our EarthbagBuilding.com site (our main website), we have a Testing page that lists all the tests that have been done on earthbags that show the earthquake resistance, bearing capacity (10 times greater than wood walls), etc. etc. How can this be you may ask? The soil is tamped or rammed solid until it’s almost like a brick. The clay binds the aggregates tightly together, and when it dries it’s very hard. You don’t even need cement. If someone crashed their car into an earthbag wall, it would total the vehicle. This actually happened once, and the earthbag wall only had some plaster chip off. Photos of this are in Doni and Kaki’s Earthbag Building book. if only the cement plaster made ​​of sandbags were maintained in position (with no adhesive between the sacks or metal brace that applies to cement dome house) what if there was an earthquake? whether to make a shift in sacks (especially the topmost position) will shift and cause the cement plaster cracks? and what if the bag is broken in a certain time? Yes, the plaster would crack just like in every other building. Mesh on both sides tied together through the wall is highly recommended to hold everything together. So the plaster will likely crack and need to be repaired, but not lead to structural failure. Almost no one uses pure sand in the bags. The standard is what I described below — use subsoil with enough clay to bind the aggregates together. Research rammed earth homes on Wiki. Earthbag is essentially rammed earth in poly bags. There are lots of ancient rammed earth structures still standing after hundreds and thousands of years. Sometimes the roof is gone and the walls have endured the rain, snow and wind for centuries… AND wars! Make a little storage shed or something to learn the basics and I think you’ll be surprised. Not too many buildings will stand up to a speeding vehicle or last hundreds of years with the roof rotted or blown off, that’s for sure. And then factor in the dirt cheap cost and it really starts to make sense to a lot of people. Help me please. I am so interested in building an Earth bag root cellar. I have contacted my city to see about building codes and included your plans for the cellar. I just received word that they will not approve the plans as they are vague and not planned by an engineer. Ugggg! That’s why we always tell people to build in rural areas with few codes. All the extra engineering fees, permits and inspections could cost thousands of dollars. There’s no point in drawing super detailed drawings that no one will use or can afford. I C, thank you. If I lived in a rural area that would help matters, but, sadly I don’t. thank you for your support, at least it sparked the interest, I will have my root cellar Earth bag or not. Thanks for all the hard work you have done. I have been comparing the earth bag construction and the CEB for making a small home and blacksmiths shop as well as fences on the rural farm property we have here south of Wiggins Colorado. I am interested in what is used in each to stabilize the soil. I heard that you had looked at different additives to make the bags or CEBs turn to a stone like form over time. What do you recommend? Would any part of this be a candidate for a work shop on this kind of building? You’ll have to contact the engineer and see if he can get plans certified in Australia: Precision Structural Engineering, Inc. http://www.structure1.com He may have a collaborative relationship with an Australian engineer who will help. Thank you Owen for your quick reply. I have emailed them. I have been longingly looking at your dome designs for a few years, and am now in a position to build one in rural Brasil. I am interested in the Peace dome, and the Enviro dome as a possible later project. Do you know of any examples of these that have been built? It would be great to see some photos. And thankyou for creating the fly-through for the enviro dome; it really helps to visualise the space. I did the week-long Cal Earth workshop last year in Melbourne. I’m hoping that this experience will enable me to tackle the peace dome. It will be myself, my wife, and a labourer working as a team of three. Thankyou for providing this comment section for communication, and well done for your ecological efforts. Most people don’t tell us about their projects. They just go about their life. We estimate several thousand or more people have built earthbag houses, but all we hear about are bits and pieces from emails and blogs and forums. So no, I can’t give you what you’re asking for. I wish I could. I wish everyone documented their project and at least put the basics out there on a free blog. I live in TN and I was wondering if your design would pass state code. Thanks for any help. You have to talk to your local building officials and see what they allow. Some areas are fine, most are not. Most areas want an engineer’s stamp on the plans. So you have to pay for the engineer plus use more expensive building methods in many cases. That’s why we’re always telling people to move to areas with few or no building codes. Hi, I’m looking at incorporating some of your fantastic plans into a children’s village nr Kampala in Uganda. The temp goes from about 15-30 degrees C http://www.climatedata.eu/climate.php?loc=ugxx0002&lang=en We would want to start small and add modules over time ideally, with a view to having some family housing for families of about 7 people. Not sure how realistic this is, and we could add some domes onto other, oblong, homes if that would work. I’ve looked through your site and the 3 roundhouses design looks like a possible place to start. Any tips please? Any practitioners out there to contact? Thanks for your help and the great site. You can leave questions on that blog and get fairly speedy answers. Try to pick a topic that’s related to your question so other reader’s will benefit from the exchange. What an ingeniously earthy cause you promote; amazing! And the energy you exude (able to respond to all these comments) – simply in a class. I thank you. I will look for your email address and connect with you in more depth. Can the earth bag home be made as large as 3000sqft with 1 floor?if I don’t have time to build myself how do I find someone in east Texas? Can you get me information on earthbag home? You can build any size you want. Just be aware that earthbag building is labor intensive. It’s most practical on smaller houses. But maybe you can hire migrant workers and keep the cost affordable. You can post a free message on our Bulletin Board at Natural Building Blog. There’s a growing number of builders who do this type of work. You just have to spend time seeking them out through google, searching our websites, etc. Running your own (self build|building projects) might look like a great idea, but with all those sub contractors comes a range of trouble, with each one blaming the others for mistakes and delays. What is needed is to get all from one source, managed by them as well. That way you get the work done on time on budget (and get to keep your hair). There are pros and cons. Building your own home is certainly not a cakewalk. That’s why I emphasize building small and simple. Add on later if you want. Also note, many people can’t afford contractors. My plans are primarily for do-it-yourselfers. My husband, three (and maybe more!) children and I want to build an earthbag home in west Texas. Its pretty dry here in our town. We are currently in a drought. And its hot here. Very hot. LIke 110 degree summers. We have found a floor plan that we like. Its actually a round house. We are wanting to know how big is too big. We are hoping to be able to live in about 1500 square feet with 4 bedrooms and 1 or 2 bathrooms. How big is too big for the diameter? We have come up with about a 22 foot radius to give us around 1520 sq. ft. We would not be doming the roof. Suggestions? Thanks so much! You can go up to about 10 meter or 33′ in diameter with good workmanship. But you could go larger with buttresses. How do you get 1,520 sq. ft. with just 22′ radius? Check the math. Or maybe you’re counting numerous small adjoining rooms. Also search our Natural Building blog for ‘passive cooling strategies’. It’s all bout wide roof overhangs, lots of windows for ventilation, high ceilings, etc. No air conditioning required. Roundhouses are an excellent choice. You can use manufactured roof trusses to speed construction and simplify the process. Hi my name is Dylan, I am looking to build an earth bag home my only concerns are electric and plumbing. Would i be able to completely do them on my own? Are there alternative methods? Would wiring and plumbing require an experienced contractor? I was wondering if you could further answer these or if you had any resources of where i can learn this in relation to earth bag homes in more detail. Plumbing and electrical are 99% same as conventional houses. Our Natural Building Blog and my earthbag building guide explain how to do the few minor differences. You could do these on your own if your house is small and simple. You can buy “pocket guides” from building supply centers that show the main steps == how to wire an outlet, etc. They cost just a few dollars each. You could also get books from the library for more details if needed. and coverage! Keep up the awesome works guys I’ve added you guys to blogroll. I love all the work you’ve done and all the information you’ve provided. Thanks for that. My family and I are soon moving to North East Texas. Average temperatures range from 53 Degrees F in December-January to 93 Degrees F in July-August. I’m concerned about cooling the house since the weather doesn’t change much overnight in the hot months. What can I expect in terms of temperature inside of an earthbag home, compared to outside? The area isn’t a very humid area so that may be helpful in keeping cooler inside I assume. Thanks for any information you can provide! Search our Natural Building Blog for keywords passive cooling strategies. I list two or three dozen low cost simple methods to prevent overheating. Do enough things on the list (5-10?) and your home will remain cool without air conditioning all summer. Would it be possible to build this “sand castle” type with either rice hull bags or straw bale instead of stick building the upper level? We are locatd on the Gulf Coast of Florida and codes require homes to be 12ft above the flood plane. We love the concept of earthbag or straw bale construction and would like to do as much as possible on our own with our 5 kids…we think it would be a great family experience and also teach our children about the effects we all have on the enviroment. I must have skipped that section a hand full of times. Thank you so much! Use rot resistant materials such as scoria. Loose material such as this will need to be enclosed in a rebar and mesh ‘cage’ for stability. Once plastered on both sides it would be extremely strong. Get everything cleared with building officials before doing anything else. They’re the main obstacle. on May 6, 2013 at 4:36 pm JohannaS. Hello, I have been researching earthbag building for about 6 months now and after ALOT of research and planning my husband and I have decided that we would like to have a custom plan made based off your “torus” duplex Idea. We would like to extend one half to make more room for another bedroom and larger kitchen, and just have a small studio apt. in onsection of the house. We had some ?’s though before we settled on this plan. We want a living roof over the whole structure to grow light weight plants (no trees or bushes, mostley veggies and herbs) and would like to make sure that this plan can support that type of roof and could we have it just slightly sloping? I would also like to know what size of overhang I could do with this roof aswell. We live in southeast kansas and do see alot of rain so I would like to protect the house as much as possible. Thanks for all the work you have done and and the information that you have made available! We are very excited about our future building projects. We are starting with a root cellar and storage shed on a friends farm and with that experience we plan to start on our house and living pool at the same time. You have done a great job at making all of this seem very doable for do it yourselfers like us and your plans are so very helpful. Thanks, and hope to hear from you. Everything you describe is possible. I suggest ordering the CAD files and working with a local designer to modify the plans because I’m getting too busy for custom plans. on May 9, 2013 at 2:28 pm JohannaS. Do you know of anyone in the Midwest with experience building an earthbag shelter? I live in Michigan and would love to organize an eartbag building workshop on my property and support someone with the building experience while allowing others to learn the method. I am interested in a very small structure as a first project, something like a 12′ by 12′ simple round earthbag room. Thanks. I think this may be the best blog I have ever seen, thank you such much for making this blog! We are very interested in the custom crow how do we draw out the plans? Is there anyone who can help us? We have a bunch of tornadoes in oklahoma anything I should do differently? Contact Structure1.com They’re the only engineers who are doing earthbag plans right now. They can make any changes and get the plans approved in your area. I love the Spiral Dome Magic 2 home. I live in the midwest, IA, and I’m wondering if it’s possible to this type of rammed earth house with a garage under it? Is it possible to design an attached greenhouse to a rammed earth home? It’s easy to add greenhouses, pantries, etc. Maybe build the garage underground or on a slope so it is a “daylight basement” or daylight garage/walkout garage. I live in los angeles county, ca. I was told housing plans have to be legal for ca, The architect creating the plans has to be ca certified. Do you know of earthbag plans I can buy that meet this requirement? Also, it has to follow code as far as size as well. Contact Structure1.com. They’re licensed in CA and most every state and most major countries. What would be the most practical design style for a two room, 300 sqft home? I just want a little cottage-type home. I just need to know how to do it. I simply need to know what to buy, how much to buy, and how to put it together best. Also, I will be in North Eastern Tennessee. So factoring in climate, how should I build this. That’s my favorite type of project. Have you looked through the entire site here? There are about 130 house designs. Did anything strike a chord with you? How about the Green House? Or what about the Hobbit House? You see, housing is a very personal thing, much like buying clothes or choosing what you like to eat. Tell me what you think. My $20 earthbag ebook summarizes all the key information from our websites. It can save you lots of time surfing. Also consider post and beam strawbale for speed and ease of construction. Earthbag is great, but strawbale is less labor intensive. And consider rice hull bags. One of our readers did two great interviews lately with Maggi who’s building with rice hulls in rainy northern Thailand with excellent success. I’d be more conservative though and use a good durable roof. Search keywords rice hulls on our Natural Building Blog. See my other reply. Designing a home is an adventure that takes time and effort to create living spaces that high quality, personally rewarding and comfortable. Enjoy the journey. Believe me, you don’t want “instant kit homes” that are soul destroying. Florida has some of the strictest building codes in the world. I wouldn’t waste my time talking to them without first hiring an engineer. The only engineer doing earthbag houses now is Structure1.com. They can get my plans code approved. But please realize, the final cost will be much higher than the low cost prices we talk about on our blog. The house will end up costing as much as any other house after paying for all the extra steel, cement, engineering fees, etc. In a nutshell, codes skyrocket the prices and make it nearly impossible to build affordably. Hi Owen. I bought your book and DVD on earthbag construction. We are developing a nine-hectare eco-village in the Philippines. I was convinced that earthbag construction was the way to go for our dwellings. Then some “expert” in fired clay brick manufacturing told us that due to the tropical climate, the poly bags would rot due to moisture. He suggests we use fired clay bricks. Logic tells me that if the walls are properly sealed, moisture should not be an issue. What is your experience with earthtbag construction in tropical areas? Moisture is not an issue because the bags are made to resist moisture. That’s the purpose of sand bags! So this guy doesn’t know what he’s talking about. Besides, lots of people are building earthbag homes in the tropics (including myself) with no problems. Read up on the project in Coron. Thank you, Owen, for your quick reply. I thought this so-called expert was off, and now you have confirmed that. Do you have any contact information for the people involved with this project in Coron? I’d like to fly down there to see everything myself. Thank you, Owen. I have emailed this contact and will await a reply. I appreciate you taking the time and trouble to reply and answer my questions. You are a great resource and doing great work for those less fortunate. Thanks. See the updated comment below about the durability of polypropylene bags (earthbags). I looked up the article and it’s actually a 500 year estimated lifespan, not 100 years. Be sure to tell your friend about this! I am working in Southwest Kenya and wanted to know if you had any plans for earth bag home that would work here. 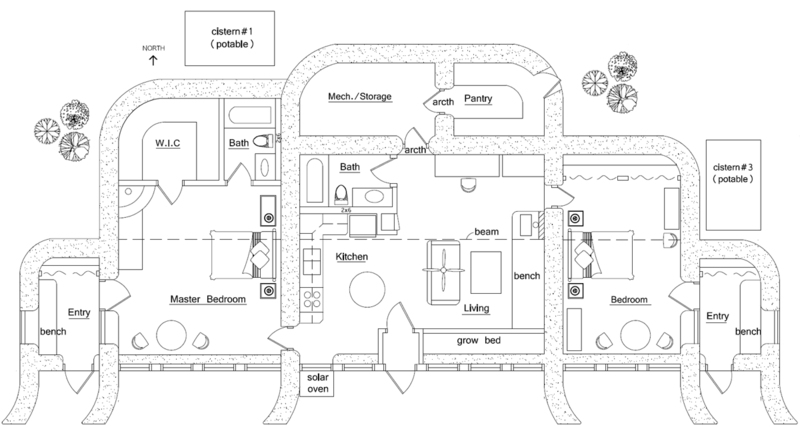 Once you understand the basics then it’s easy to design your own small house. You don’t need fancy plans if you’re building where there are no codes. You won’t be able to pound bamboo down through earthbags. You could add external bamboo pinning if you’re in a seismic zone. Most buildings are fine with standard earthbag building techniques. Read our free earthquake resistant earthbag building guidelines if you live in a seismic zone. Search our blog. Hello, I live in the Great Basin area of northern Nevada. We have pretty cold winters and unbearable summers, but very little moisture. I would love to build a small earthbag home. Some of the soil on our property has actually been sold to the county to use under the highways. Would that soil be suitable by itself to use in earthbags for insulation with our wild temperatures? Or should I use scoria or something else? Thank you in advance. It sounds like your soil is similar to road base. If so then yes it will work fine. However, soil has low insulation value. It is high in thermal mass and can stabilize temperature differences but only so much. In your situation, consider adding rigid foam board insulation and stucco on the outside. I want to have someone build and earthbag house for me but I can’t find a contactor. Do you know any contractors that I could get ahold of ? Most likely you would have to learn everything and oversee the project as the Owner Builder. I like the Earthworm Studio design. I just bought some land and the County Government Building Inspector wants official architect plans with an architect seal on them. Before I pay the 150 dollars for the plans I want to make sure that the Building Inspector will approve them. To be blunt: are you or do you have some cohort working for you that can put an architect seal on them. I also do not understand if this seal must be placed on physical paper copies- thus making the purchase of 150 digital pdf files worthless. If that is the case can I pay you another sum of money to print them out and have you or your architect friend place his government code pleasing seal on it. I live in Arkansas. This plan was custom designed to circumvent codes! It would be nearly impossible to get it code approved. To get code approved you’re better off building a simple rectangular post and beam strawbale house. Strawbale is already in the codes and widely accepted. But then you face greater risk of moisture damage… That’s why earthbag is superior in rainy climates. And that’s why I moved to where codes are nearly non-existent. You’re going to pay nearly 10x more if you have to meet codes. So look for alternatives such as fixing up an old house first and then building an ‘outbuilding’ out of sight for ‘storage’. Thx,,Robert ,,,,where you hangin out now,,,I’m in Boulder,,,! Hi Robert. I gave my plans to Habitat when I left. I’m surprised they’re not still selling them. They made thousands and thousands of dollars selling them. Have you asked the architect? I’ll email you. I have been looking into building with sustainable materials in Central Florida but I really have been unable to find the right one since we will have to build to code. I like the idea of a cob, straw bale, or cordwood house the most but I am not sure what would really be well suited to our hot humid climate. Straw bale is a particular favorable since it can be quicker to build with but I really do not know if it would make it for 50 years here. Are their any materials that you would suggest that would be economical and well as sustainable? Or should we just remodel an old house? Earthbag is the standout choice in my opinion. Not only is it the strongest in terms of wind resistance, it’s also extremely durable in rainy/humid climates if you maintain the plaster and build a good roof. I LOVE strawbale for it’s speed and ease of use but reports of water/mold problems in rainy climates are already trickling in. The risk in Florida would be off the charts and just not worth it. Structure1.com can get earthbag building code approval. First, you will need architectural plans before they will begin the engineering process. They approve my plans. Thank you so very much for your reply! 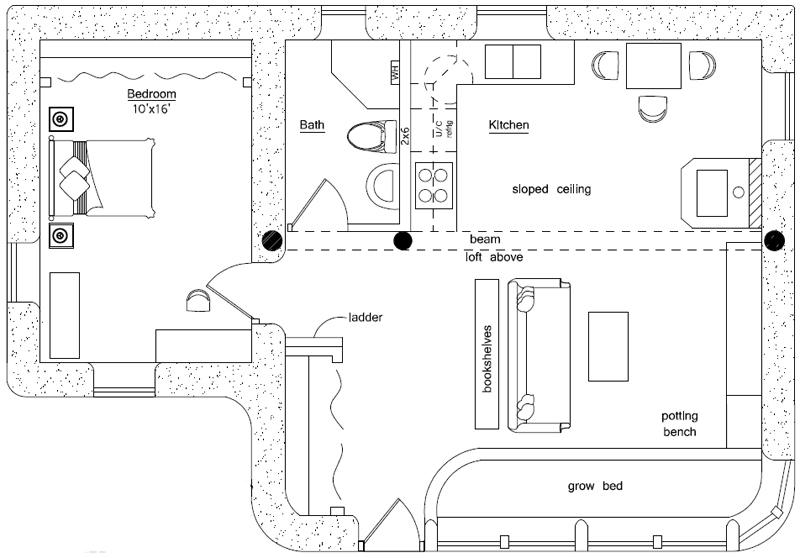 Your cordwood house plan is very similar to our idea, ours is 27 x 42 and 864 sqft on the ground floor, but could we build the walls 12ft high to accommodate a small attic/living space with a 4/12 roof? Is it easier to build up or out with earth bag? Anything is possible if you use correct details and reinforcing. It’s easier to build out because soil is heavy and it’s very difficult moving high up in the air unless you have a tractor, etc. Do you think ICF or earth bags are superior to hurricane resistance? I noticed on dreamgreenhomes.com that some of your plans could be constructed with ICF. Earthbags in general are stronger because the walls are wider and heavier. If you built a double wyth interlocking ICF wall then they’d be about comparable. But of course using twice as many blocks would skyrocket the cost. The main challenge with earthbags is they are labor intensive so workers need to be strong. Also most contractors don’t know about this method so you almost have to do most of the work yourself (maybe hire some laborers to help out). What Was your farm house desing budget.? We love Earthbag building and whilst we needed to make a few mild compromises on the design – we managed to get it to meet Australian Building Code and are building a version of the Enviro Dome 2 (modified a bit to our liking) here in Australia.